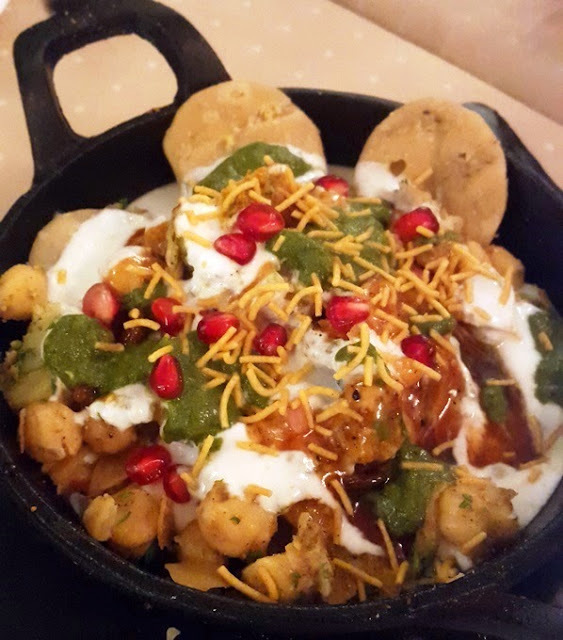 Grubzon - A Gourmet Voyage: Gaylord - Purani Dilli Ki Chaat - Churchgate, Mumbai. Gaylord - Purani Dilli Ki Chaat - Churchgate, Mumbai. Chaat which is a colloquial term for Savory snacks, is known at every nook and cranny of India. It usually consists of Potato based or Fried dough based snacks with local variations. North Indian Chaat and Mumbai Chaat are two famous variants that are known by any gastronome today. Being a resident of Mumbai, I am well acquainted with the Mumbai version. Due to my North Indian origins, I often visit the Northern side and thus I am initiated to the Northern Chaat. But I have not had enough of it to call myself a connoisseur. Delhi is well known as a hot pot of Northern food culture and like Mumbai, its a metro with its own culture of Chaat. However, I cannot fly to Delhi just for snacks. This is where one of my famous restaurants Gaylords came in to the rescue. 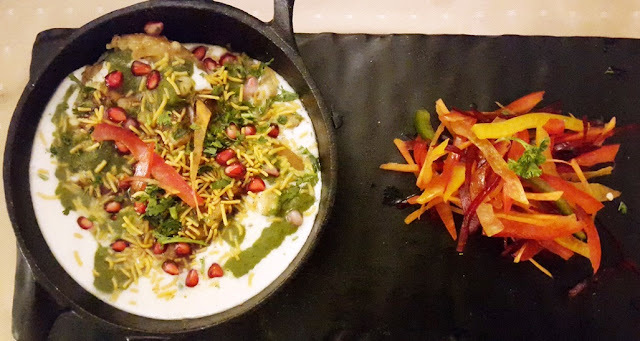 The "Purani Dilli ki chaat" festival was another one of the seasonal events at Gaylords. Translating to Old Delhi's Chaat, this festival brought the North to Gaylord's Tables. The prices may feel a bit high for chaat but its better than flying to Delhi. Additionally, Gaylords excellent hygienic standards make the chaat fit for everyone. Gaylord has found repute on Trip Advisor and many other portals. All for good reason. On that note, the prices feel actually easy to me. Ram Ladoo is the Northern version of Moong dal fritters or Dal Wadi as we call it Mumbai. 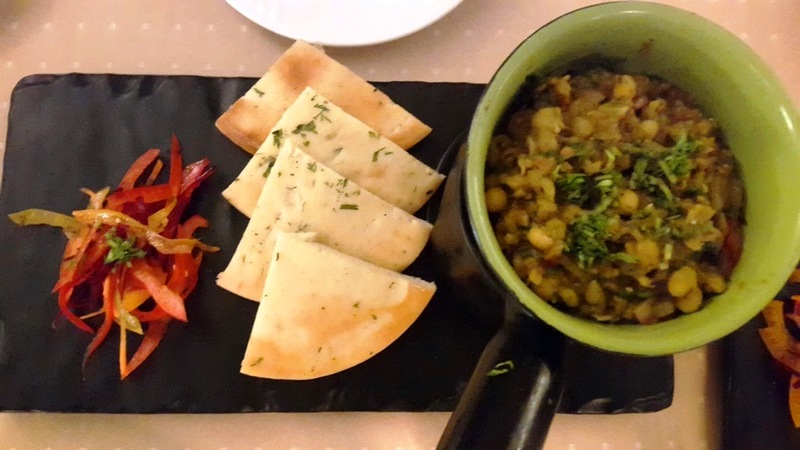 This had a very basic moong lentil flavor as its meant to be complemented with chutneys. It was served with batter coated pepper stuffed with veggies. The flavor was subtle and easy on the palate. 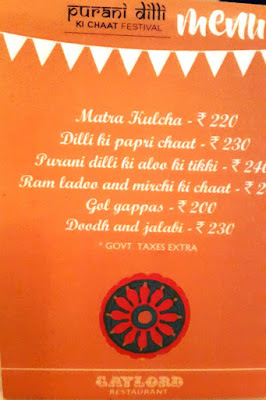 The Matra Kulcha may confuse even Hindi speakers. "Matra" is the same as "Matar" or peas. The Kulcha bread paired well with a savory snack made out of peas. This was the best dish on the menu. Good Visuals, lip smacking flavor and very filling on its own. More than a snack, this would qualify as a full meal. 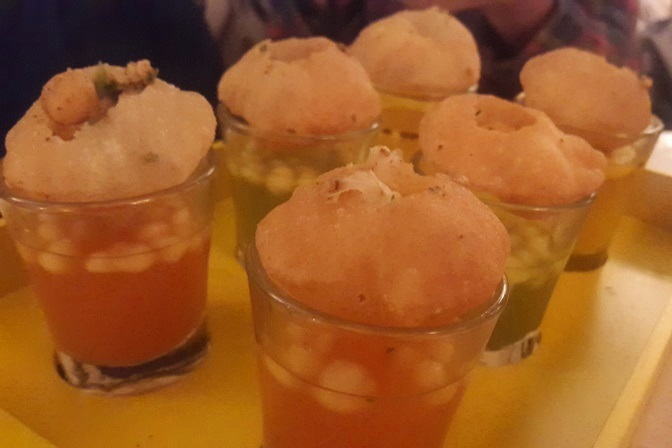 Ask anyone who knows me and they will tell you that I am not a fan of Pani Puri. In the North this is called "Gol Gappas". Don't get me wrong, this is delicious. My reasons for disliking it mostly have to deal with the unhygienic way with which its made at street shops. 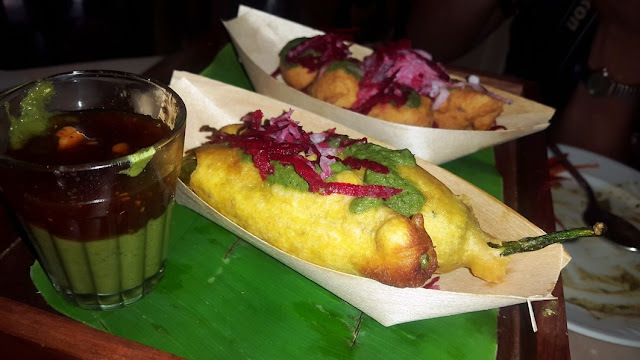 That problem is removed at Gaylord with these deconstructed Gol Gappas. Instead of having a shoddy street vendor making this with his bare hands, I am safe with making these on my own. One must fill the hollow crusts with a chick pea based stuffing, fill it up with some chutney and quickly gobble it in one bite. Its actually fun doing the whole thing yourself. Gaylord served us three chutneys. I found myself liking the Tamarind chutney as opposed to the other two. Dilli Ki Papdi Chaat - This one is based from North India though it is possible to find it in Mumbai. Gaylord's version was sweet and savory with a cooling after flavor from the addition of mint. Made of crisp dough wafers, these were loaded with sev, potatoes, chickpeas and pomegranate. It is a dish widely enjoyed by us Indians and one not to be missed by any tourist visiting India. Purani Dilli Kil Aloo Ki Tikki. Literally translating to Old Delhi's Potato cutlets, these are minced potato cutlets immersed in curd and chutneys. A mix of sweet, savory and spicy this was one of the best things on the small menu. Fresh Jalebis with Rabdi (Condensed Milk based North Indian dessert) were served as desserts. 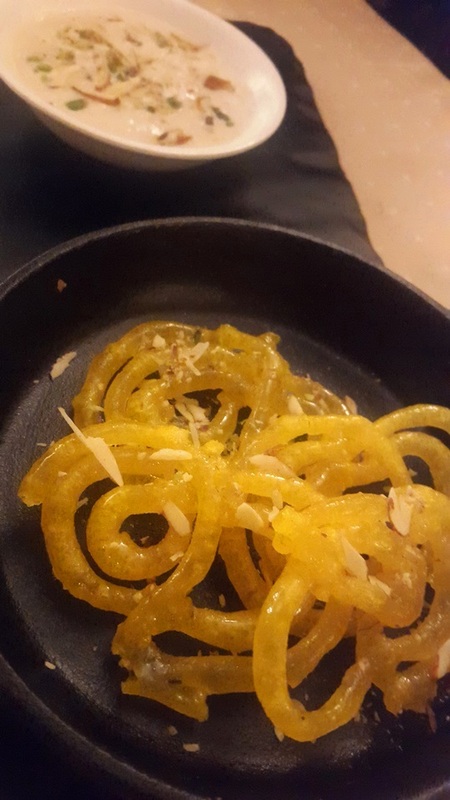 The Jalebis were to be dunked in the Rabdi like oreos in Milk. I preferred having both separately. These two are commonly found in Mumbai so these were flavors that I am well acquainted to. While these did not feel special, these were certainly delicious. This concluded my tasting of the Purani Dilli ki chaat at Gaylords. The service was a bit slow and I had to remind them to provide me cutlery and drinking water but otherwise it was a good experience.